The Twitter powered, sampling, vending machine! Bev is parked in Wembley Square until tomorrow Friday, 22 June. 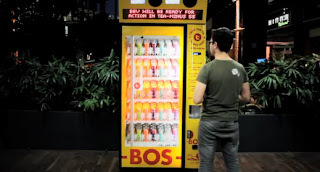 "Enjoy your BOS Ice Tea, says Bev (robot voice)".